Limonium ramosissimum ssp. 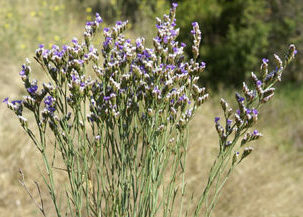 provinciale (Algerian sea lavender) is a perennial plant (family Plumbaginaceae) that can be found in Southern California. An ornamental escape native to coastal Mediterranean, it grows in coastal areas and sand dunes. The plant reproduces by seeds which can retain the ability to germinate after two weeks floating in salt water. Currently only the provinciale subspecies is listed on our Inventory. However, many collections recorded in California have not included a subspecies. Also, the Limonium species along the southern California coast may actually be Limonium duriusculum rather than L. ramosissimum.